We're off to another tea party with Mothermark (da Muddermark) and all her ladybug friends to a Country Estate in New York to save Ladybug Lou-la-Bella from the clutches of a bug thug! I must be honest and tell you that when I heard that Ladybug Lou-la-Bella Rock-a-Fella has boo-koo muhla, I was all aboard zgirlsgranny's cruiser. 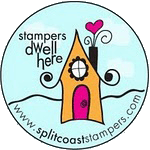 After all, what ladybug doesn't need more stampin' supplies??? Guess what else? This week we get to have tea and biscuits BEFORE we rescue Lou-la-Bella so we can be all energized for rescuing her after our long ladybug cruiser ride to New York. da Muddermark is getting smart: feed 'em before you work 'em! In case you're wonderin' what that dust (glitter that didn't photograph well) is all over my ladybugs, it's protective powder against the Bug Thug's slimy spit that he uses to deflect anyone or anything from saving Lou-la-Bella. 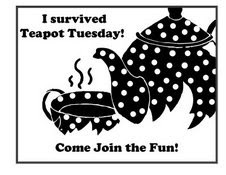 The more ladybugs we bring, the better the chance we have to over power the Bug Thug, so I hope you'll join us in da Muddermark's Teapot Tuesday challenge and help us out! Bertie! You must try to control you road rage! Whut? No he didn't! I think he was just trying to move over slightly so that he wouldn't have to drive in all that slimy sloppy sloshy slithering spirit spit you slung outa the window! Shh! Get control of yourself. I personally wanna get to the Rock-a-fellas! We don't wanna waste our ladybugs on a bad case of road rage! Here have some M & M's. Yes, Bertie, I have tons and tons of them...yes, they have peanuts in them and no, I won't give anyone else any, just you!! There you go....now you are being a good girl! I loved your card! 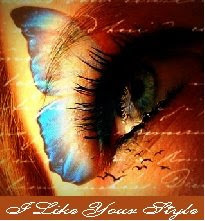 And your story! Snort!! 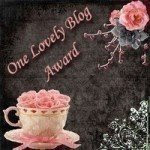 This is so beautifully done, Charlene!! I love ladybugs. This is fabulous, Charlene!!! I love your take on this teapot!!! 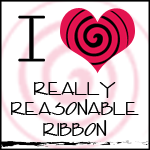 The assorted ribbon knots just scream wonderful!!! Great looking card!!! Oh what an AWESOME ladybug card! I'm TOTALLY LOVIN' the flower border with the scallops...gonna have to try that! Would you look at this! My goodness, this is super adorable! haha...you are such a goof....i told ya---dont drink the tea that mothermark is feeding you---it corrupts the mind! Such a cute card despite your condition! Hope you make a full recovery! Ya'll are having way too much fun over there on that country estate!! Get back to stamping!!! And tell Cindy you need more than tea and biscuits, hold out for lemon meringue pie for gawdsakes!!! Sounds like you are causing quite a ruckus, girly....what's the deal????? You need to get your ladybugs in line, take care of that slimy globie bug and get on with the party!!! Anne is right...we need some Lemon Meringue pie!!!!!!!!!!!! BTW, is it really true that you throw things like snot and other body fluids????? If I bring some M&Ms will you promise to behave????? Just to be safe, I am going to dust myself with the protective powder...can't be too careful!!!!! What a perfect card for the challenge!!! 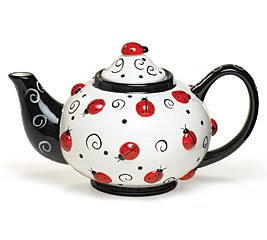 Oh this is so cute and matches perfectly to the teapot! Love the scallop edge! Absolutely darling card Charlene!! Looks like you are causing a bit of trouble though...Cindy has sure rubbed off on ya!! YIKES!! Don't know how to keep all of you in line!! I may need to recruit Hoots!